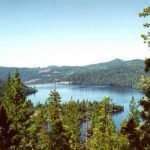 The Lake Beardsley Reservoir is located in the Stanislaus National Forestry. The main draw to this large lake is the abundance of fish. 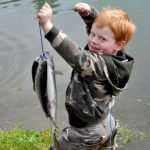 Brown trout and rainbow trout are the most common fish found in the Lake Beardsley Reservoir because it is cold water. While there is very little spawning that occurs naturally in the Reservoir, the Department of Fish and Game provides many fish. 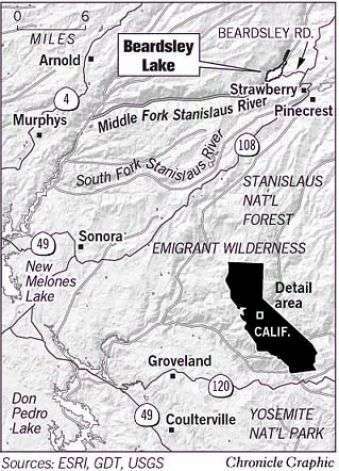 For some more detailed information about the area of the Lake Beardsley Reservoir, you may consult this map: http://www.fishsniffer.com/maps/Beardsley.gif. For best results, you should probably bring a boat. They have a boat ramp on the east side which can be located on the map. There is little area to fish right off the banks except for a small area by the boat ramp and off the dam. The area near the boat ramp also includes a picnic area.